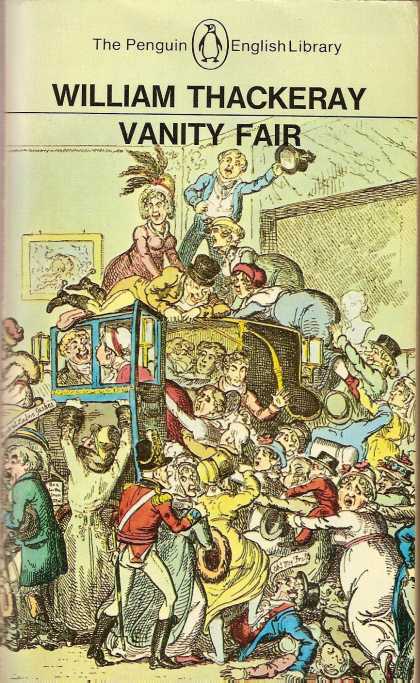 This entry was posted in Author Interviews, Book Giveaway, Books, Jane Austen, Jane Austen Popular Culture, Regency England, Social Life & Customs and tagged Author Interviews, Book Giveaway, Charlotte Bronte, Christian Fiction, Faith-based Fiction, Gothic Fiction, Historical Fiction, Jane Austen, Jane Eyre, Julie Klassen, Regency Fiction, Romance, The Secret of Pembrooke Park. Bookmark the permalink. Sounds like an author I would very much enjoy reading. Thanks for the giveaway! I have a couple of Julie’s books and need to look at the ones I have missed. I am interested in the forth coming book with a marriage in name only. That must be hard on a couple to have yoked together for life but living as siblings. I am so excited to read Julie’s next 2 books! They can’t come out soon enough!!! I really enjoy this interview and love Julie Klassen’s books. I can’t wait to read “The Secret of Pembrooke Park”! I have not read all the work of this author but the ones that I have -have enjoyed a lot. like your blog and the chat today. victorian pic is really pretty, I wish ladies dressed up more today. thanks for sharing. I love how gorgeous every one of your covers are! That’s 90% of my decision to like a book or not!! 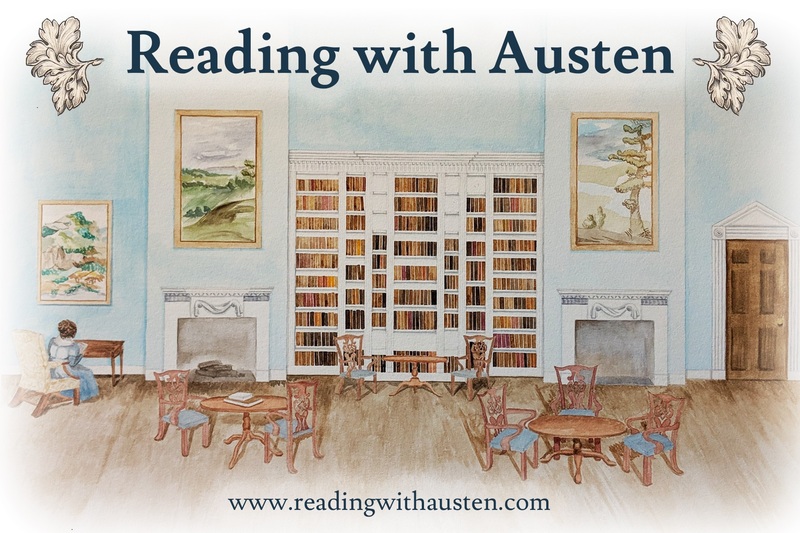 When my mom and I first discovered Julie Klassen’s books, we were deep in fascination with Jane Austen and Jane Eyre. 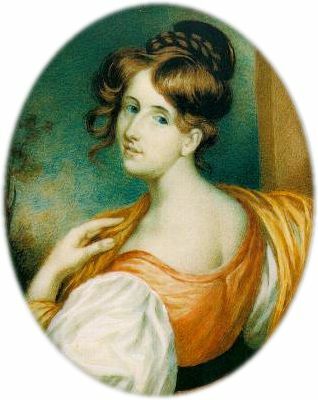 Ever since becoming an Austen, Bronte, Gaskell fan, I have been in search for more Regency period authors. Julie Klassen definitely falls into that category. 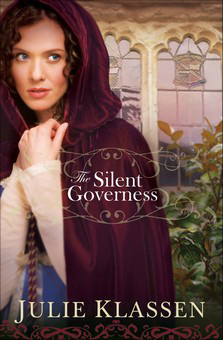 I love that there are now more Regency period novels. I loved The Secret of Pembrooke Park! I recently saw a new show that reminded me a lot of the our William Chapman – a PBS Masterpiece series called Grantchester, where the hero is a dashing young clergyman who does not fit the stereotypical role. 1950’s vs Regency, but both are mysteries! Great interview! How wonderful that we have two books to look forward to this year! Lovely interview ladies. I cannot wait to read this new book!! I have read and love all of your books Julie! I love the Era in which you write. 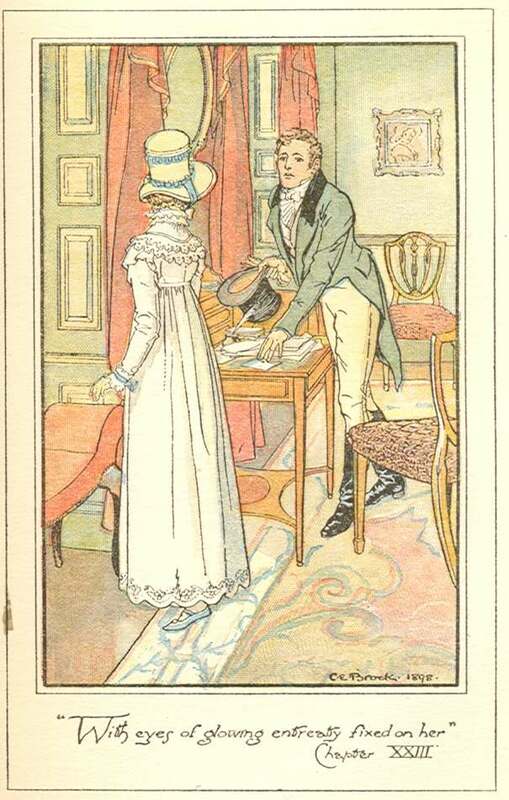 Darcy and that edition of pride and prejudice are my favorite as well!! My mom and I have watched it over and over again and we never get tired of it! I am ssooo excited for your two new books coming out I can’t wait to read them!! I LOVE the books that I have read so far!! 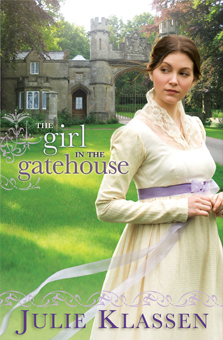 I have read The Tutor’s Daughter, The Maid of Fairbourne Hall and my most recent read The Girl in the Gatehouse. Please keep on writing.\!! Lady Maybe sounds like a great book! Super excited for July! I love Julie’s books and always look forward to the next one! I think her newest is my favorite yet, and I hated for it to end! I’m happy to hear that she has two more coming out this year! Thank you for the valuable information on your novels. I just finished “The Secret of Pembrooke Park” which drew me in because there is a Pembrooke Estates in my local area. Very nice homes. My favorite is still “Lady of Milkweed Manor” and have loaned it out many times. I own all 8 books and looking forward to the new one coming out this summer. Oh, I just love Julie Klassen! 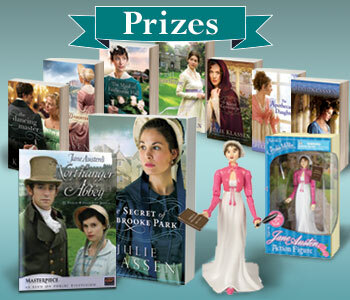 I am so excited to read The Secret of Pembrooke Park, as well as Lady Maybe and The Painter’s Daughter later in the year!!! This was a very thoughtful, informative post. Your blog is lovely. Thank you for doing such a terrific interview with Julie and taking part in the blog tour. Thank you so much for hosting me here, and for the insightful, well-informed questions. I appreciate it! Oh I want to read The Girl in the Gatehouse even more now! :D And I’m really intrigued by Lady Maybe! I wonder why Bethany House isn’t the publisher though? I’m gonna have to look into giveaways and local stores to see if I can get a copy if I can’t find a way to get a review copy! ;) The Painter’s Daughter sounds interesting to! I need to look in to that! I’m so excited about the blog tour! Julie Klassen is one of my all-time favorites! I agree these books that are set in this period are the most interesting. Thank you for the fun giveaway. Any books with these themes are a favorite of mine,too. What a great giveaway. I love to read any books with these themes. What a great interview! It makes me excited to read Julie Klassen’s other books. They all sound wonderful! It was a great interview! I am excited to read her other books and the next two sound like they are going to be great! I am a HUGE fan of yours Julie! I’ve read: Lady of Milkweed Manor, The Apothecary’s Daughter, The Silent Governess,The Girl in the Gatehouse,The Maid of Fairbourne Hall. I can’t begin to tell you how much I look forward to all your other books! You’ve instilled the love of everything Regency & the pursuit of other authors who write in this time period! It must be such an adventure to be able to go to England on occasion for your research. I really enjoyed your interview here & sharing a bit more about yourself and your books. “The Secret of Pembrooke Park” sounds intriguing , and one I’d love to have for myself! All of your books as a matter of fact would be great to see on my bookshelf. Thank you for the wonderful opportunity to win your books! Blessings on your writing, Julie! Thanks, everyone, for commenting. Glad to hear so many of you are looking forward to the next book(s)! Thank you, Julie for being a guest on this blog and for so graciously answering all my questions! Wishing you the best with Pembrooke, and can’t wait for the next two! I am delighted to see how many people have responded here and on the other blogs – you have quite the following! I can not wait until the next book comes out! Julie Klassen is one of my favorite authors. And I would love to enter the giveaway! This was a great interview. Cannot wait for what is next on blog tour. Thanks. This is a very informative interview with Julie. 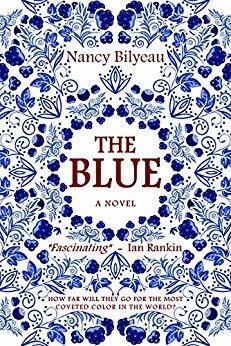 I always find it interesting to find out more about the writing of the books I love to read. I’ve read a few of Julie’s books, which I’ve very much enjoyed, but I need to pick up the pace and get the others read! I’m really looking forward to reading The Secret of Pembrooke Park. Wow, what a great book. I have to get some of her other books. Great giveaway. Oh I love all of Julie’s books!! Can’t wait to read this one too!! Colin Firth as Mr. Darcy definitely would have gotten me hooked on Jane Austen if I hadn’t already been a fan. Great interview & giveaway. 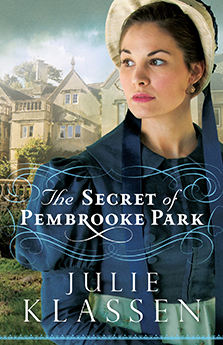 I have The Secret of Pembrooke Park on hold at the library and can’t wait to read it. 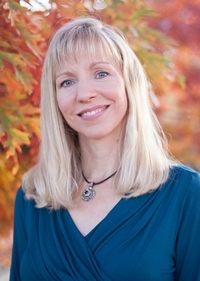 Thanks for this insightful interview with Julie Klassen! I’m looking forward to reading Pembrooke Park and now to Lady Maybe as well. I’ve read all of Julie’s novels and love them! I look forward to each and every new novel. Keep them coming Julie. Your story lines are unique and have wonderful characters. 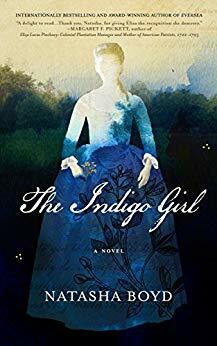 I am so excited to read her upcoming books, especially The Painter’s Daughter!!! What a lovely interview! So many topics covered and such interesting answers. Julie, I’m excited about your upcoming books. I know what I’ll be purchasing in July and putting on my Christmas list in December! Great interview! And I’m very happy to see more books from Julie coming soon! I really enjoyed The Girl in the Gatehouse. Thanks for the interview! This is a very exciting giveaway! What a neat interview! As a Christian, I love the faith based components. How cool are all your covers Julie! They’re so pretty and just draw me to them. What a delightful interview and such a generous giveaway! I’ve read The Lady of Milkweed Manor and I’m currently reading The Apothecary’s Daughter and I’m quite certain I’ll be investing in additional titles! Thank you both for the interview. Also thanks for this wonderful book tour. Great interview! I just wanted to say that I love the way that Julie incorporates romance in a tasteful way. I think that this allows for a broader readership (Christian or not) who like romances but do not like the over sexualized romances. Wow I loved the questions you asked. I had wondered many of those questions myself. I agree with the interviewer in that these novels touched on many difficult topics and your heart really reaches out to the characters. 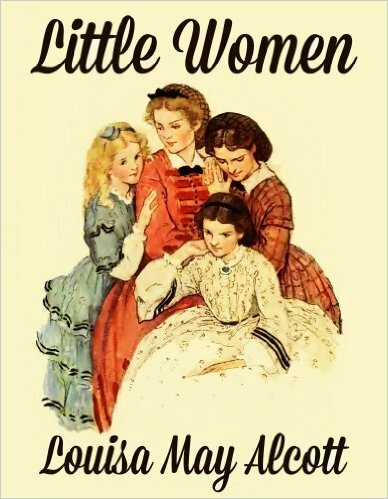 I love bronte, Heyer, and Gaskell as well. 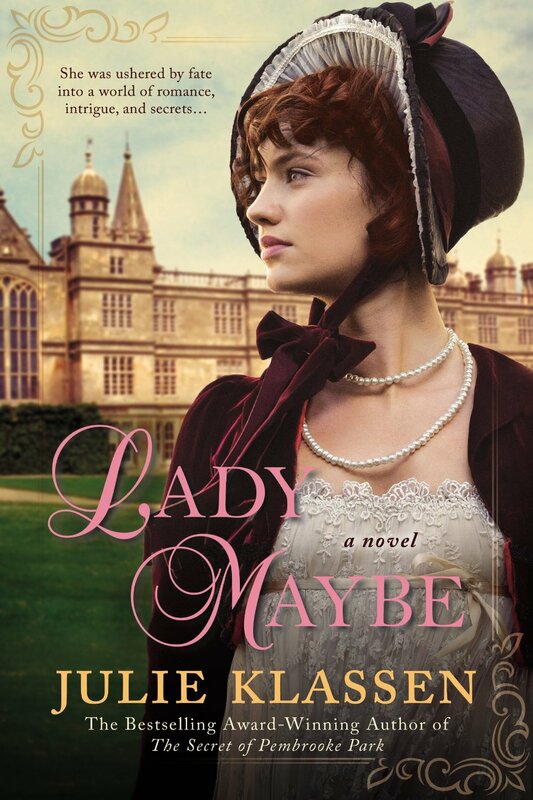 Lady maybe and another one due out this year – wow! I’m so excited to know this. What an interesting interview. I think it’s neat that the books start from a situation and grows from there. Really enjoyed this interview with Julie, especially the references to novel inspiration, research, and faith. Love your books, Julie! I love your post. Thanks for your generous giveaway. I’ve often wondered how other authors can write JA without this reality of the era.. Thanks, Julie and thanks for the great interview ! I find it odd that Jane Austen, herself, didn’t mention more of this in her own writings. One would ndver know her origins from her books. However, I do think it is somewhat shocking to ahve some ppeople use her characters and stories in a manner which would hav shocked her. I think that church services and Bible reading were such a oart of her life that she thought it unnecessary to mention it.